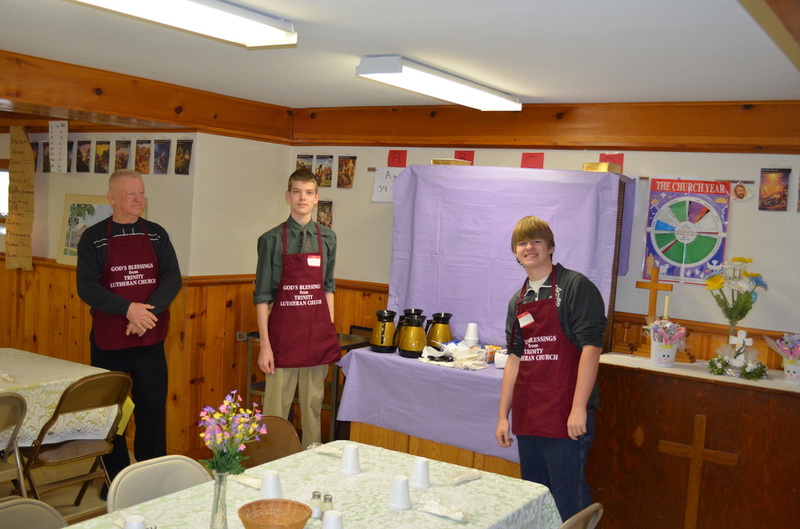 ​March 31st, 2013 marked the 15th year Ernie Falk has been involved in the serving of Easter breakfast at Trinity Lutheran Church in New Lenox. For about the last 10 years, he has had the faithful assistance of Les DeCarlo. The two men together have rallied support from a number of other members in their annual organization of this event. 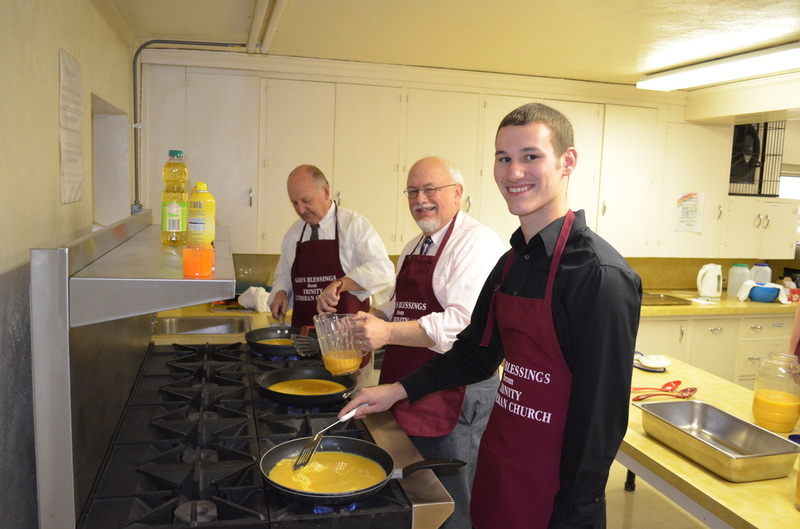 This year's breakfast was another flawless event, which featured scrambled eggs freshly prepared by Garrett Aiken, Bob Romadka and Phil Macfarlane. 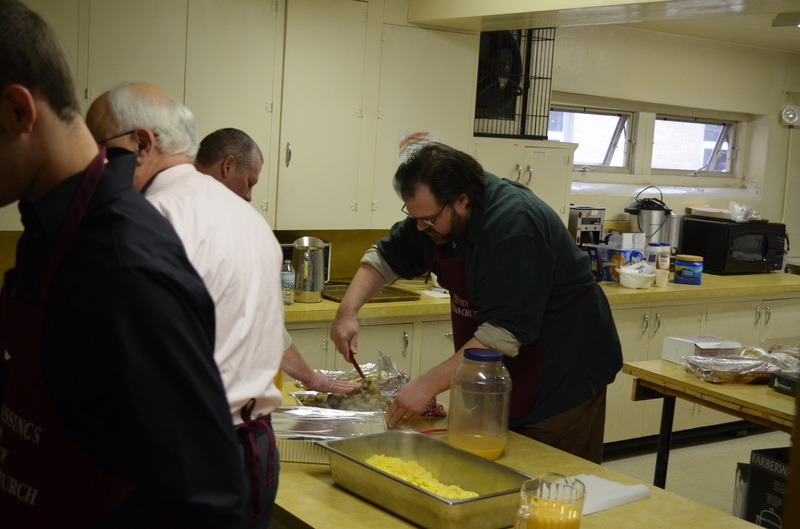 The eggs accompanied ham that Ernie prepared and this year's new addition to the menu was two large pans of potatoes, prepared by Biff Aiken that were summarily devoured by the approximate 100 members of the church who came for breakfast between services today. 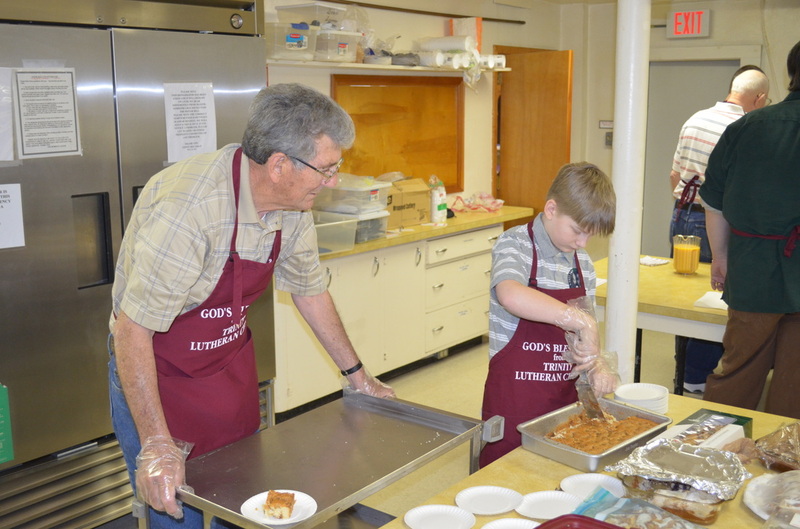 In addition to a hearty meal, a number of homemade coffee cakes, muffins, donuts and other sweets were laid out for the meal - all donated by members of the congregation. 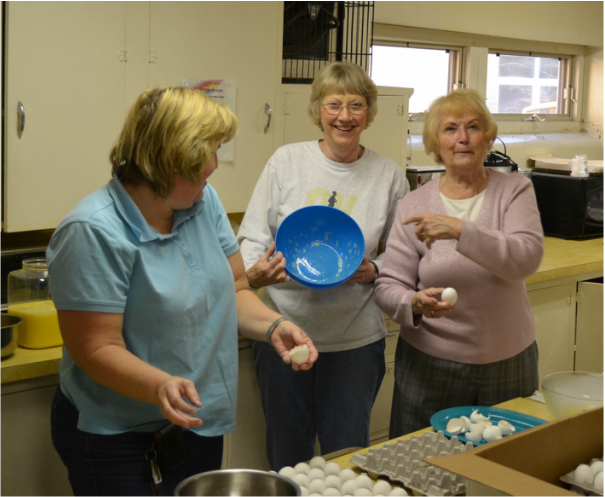 Women's League and Social Ministry, spearheaded by Midge Meents, also donate their time and energy to help make this breakfast a success. 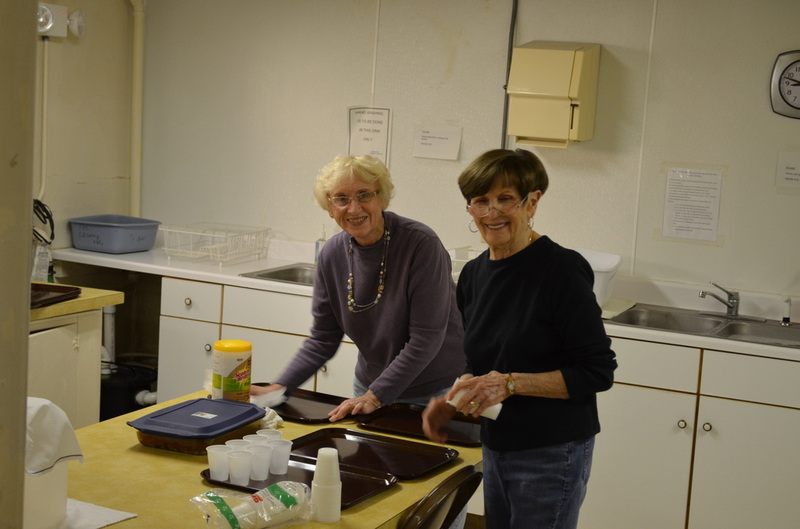 Many members of the congregation showed up on Saturday to help set up or to drop off an item for the Easter breakfast, and many more showed up on Sunday to lend a hand to the event. Ernie & Les joked that when they turned 80 (yes, 80! ), they would step down from their role as event coordinators. Fortunately for the rest of the congregation, that did not happen this year as they easily managed to run another event despite their passing this milestone. At a time when most octogenarians are the ones being served, it is quite remarkable to see these two still serving others. 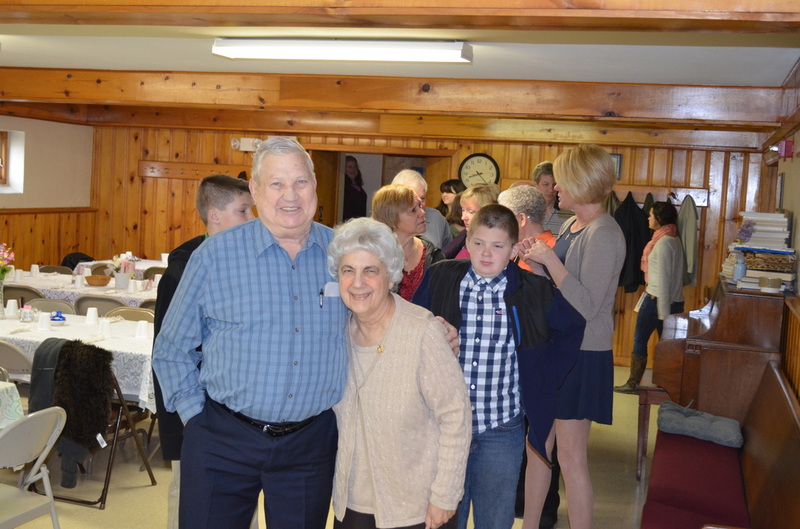 And if you believe that behind every great man there's a great woman, you would find ample evidence of that in Jan Falk and Ginny DeCarlo, who might tell you it is their husbands who do most of the work for this event, but their significant contributions are not to be overlooked. If you haven't attended this event before, please give it a try next year. We look forward to another successful event and we are grateful to have members like Ernie and Les who are willing to lead this effort. 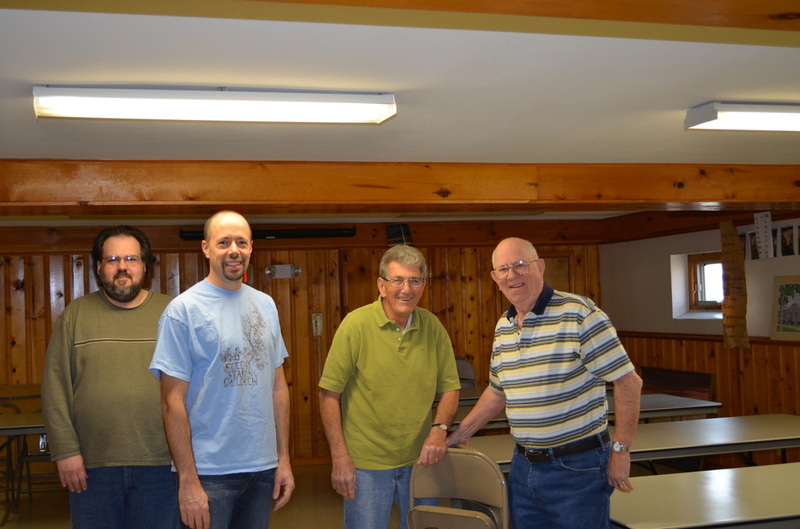 Newcomers this year, responding to the call for future event coordinators, included Andy Verchimak and Jeff McDonald, who plan to work with Ernie and Les again next year to ensure another successful event. In keeping with the spirit of giving, leftovers from today's event were packaged up for delivery to Morningstar Mission, where several members of Trinity, including Ernie & Jan Falk, regularly volunteer their time. 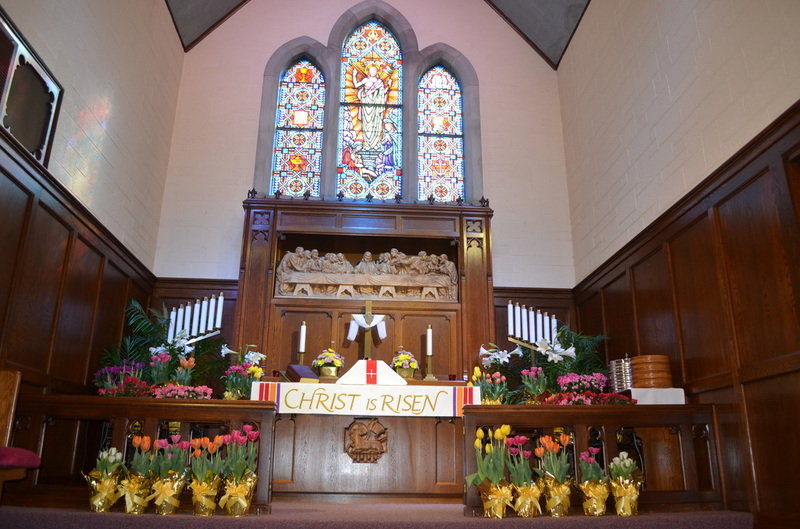 Finally, here is a picture of our altar, adorned with Easter flowers from many members of the congregation. One could debate what smelled better today - the breakfast downstairs or the sanctuary upstairs. Either way, you couldn't go wrong today!